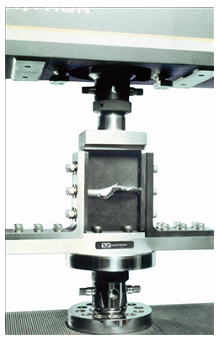 This Compression After Impact (CAI) test fixture was developed by the Boeing Company. The specimen, typically, but not necessarily, a quasi-isotropic laminate, is 6" long, 4" wide, and approximately 0.2" thick. The test specimen is first impacted, typically using a drop-weight impact testing apparatus, and then is compression loaded to failure in the fixture shown. The specimen is simply supported along all four edges, the fixture being fully adjustable as indicated by the large number of screws, to accommodate small variations in specimen width and thickness. The top (loading) plate, which is not directly attached to the lower portion of the fixture, slips over the top edge of the test specimen to provide simple support for this fourth edge. The side rails are short enough to insure that a gap between them and the top plate is maintained during the test. Ts diagram, how to find points on Ts diagram? how to find points on Ts diagram?